1976년 경기도 양평군 신화리에서 농지를 정리하던 중에 우연히 발견된 높이 30㎝의 불상인데, 이곳에서 기와조각 등 유물이 많이 나온 것으로 보아 예전에는 절이 있었던 것으로 보인다. 불상은 대좌(臺座)와 광배(光背)를 잃었으나, 보존 상태가 매우 좋고 도금이 거의 완전하게 남아 있다. 얼굴은 길고 둥글어 풍만한 느낌을 주며, 목은 매우 길고 굵게 표현되어 있다. 얼굴에 비해 몸이 매우 길어 비현실적인 모습이다. 옷은 양 어깨에 걸쳐 입고 있는데, 가슴과 배를 많이 드러내면서 U자형의 주름을 만들고 있다. 가슴에는 가로지르는 3가닥의 선을 새겨 속옷을 나타내고 있다. 치마의 옷자락은 몇 줄로 겹쳐져서 굵은 곡선을 그리고 있는데, 주름의 형태가 특이하며 부드럽고 자연스러운 느낌을 준다. 양 손가락이 없어진 상태여서 정확한 손모양은 알 수 없으나, 오른손은 들어 손바닥을 보이고, 왼손은 손끝이 땅을 향하여 손바닥을 보이고 있었을 것으로 추측된다. 묵직하고 단순한 원통형의 몸체, 간결한 U자형의 주름은 중국 수나라의 영향을 받은 것으로 보이며, 당시 신라가 점령하고 있던 한강 유역에서 출토되었으므로 신라시대의 작품으로 추정된다. 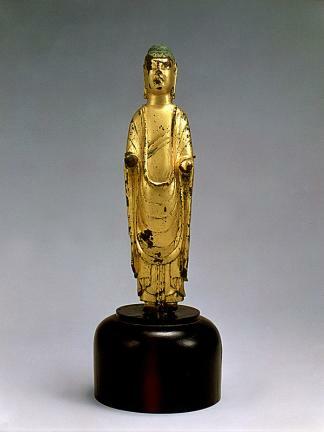 This 30cm tall Standing Gilt-bronze Bodhisattva was found by chance in Sinhwa-ri, Yangpyeong-gun, Gyeonggi-do Province during the adjustment of arable land in 1976. The farm seems to have been originally a temple site, judging from various relics including roofing tiles. Although the pedestal and a mandorla are been missing, it's still in good condition and perfectly gilded. Giving an impression of abundance, this statue has a long and round face, with a long and thick neck. The body is disproportionately long for the face. The robe, which covers both of the shoulders, form U-shaped robe folds at the chest and belly. The three crossing lines on the chest are the underwear. The piled train depicted a bold line, which gives a natural and smooth impression. Since all the fingers on both of the hands are missing, the exact shape of hands cannot be recognized. Its right hand is raised with the palm facing the front, while the tip of its left hand is pointing down to the ground with the palm facing the front. Massive, simple and cylinder shaped body and U-shaped folds seem to be influenced by the Chinese Su. This statue is assumed to be made in the Silla Dynasty, for Silla occupied around the Hangang River area at the time.